Mattel's View-Master is a wonderful rethinking of the popular toy. There's appeal here both for child and adult, with bespoke Experience Packs to entertain and educate, as well as full support for the Google Cardboard ecosystem. You will lose your smartphone to it, however. Virtual reality, or VR, is very much the hot topic in 2016. With VR systems appearing all over the place, Mattel has reinvented the classic View-Master as its own pitch into this futuristic entertainment space. Originally launched as a stereoscopic toy, and evolving through the middle of the 20th century, the View-Master has a special place in toy history for many of us. Leafing through photos with a pull of the lever transported you to a far-away place, perhaps only matched by the excitement of that Fisher-Price telephone on wheels - yes, the one with the wobbly eyes. It's on this wave of childhood nostalgia that Mattel brings us the View-Master once again, for a new generation. As before, show this to a child and they're transported to a magical place, one that's technologically sophisticated in this modern VR form and a lot more adaptable than the picture show of the original. It's fitting, then, that the new View-Master crosses this divide between young and old, bringing wonderment to all ages: at £23 it's as much as plaything for your children as it is your inner child. The View-Master recreates the viewer in red plastic. It's vaguely similar in visual appearance, but now has a futuristic leaning. The tinted visor lends a space-age look, while the rounded finish to the latch on the top is reminiscent of a photo reel from the original. There's an orange lever on the side, sitting in the same location as it was originally to move through the reel, but now used as a selection button within the VR applications - more on that later. Towards the back is a black rubber baffle that aims to block out light while giving some sort of seal against your face. It's here you look through the lenses to view the smartphone housed within (you'll need to provide that part of the puzzle yourself, of course). 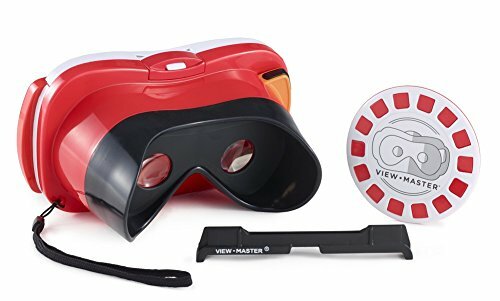 The front tinted visor isn't just there for looks as the View-Master offers augmented reality (AR) functions when using Mattel's bespoke content, so the phone inside needs to be able to see out of the front using its rear-facing camera. The View-Master sits rather more on the toy side when it comes to construction and feel, more so than something like Samsung's Gear VR. There's no head strap so - and like some other VR headsets that use a smartphone, such as Google Cardboard - it's a case of holding it to your face to view the content. There's fun in that approach and, priced at £23, that's perfectly fair. It only costs a little more than some of the cardboard VR viewers, but it's going to survive the wear and tear of being passed back and forth much better, plus you can wipe its plastic construction clean. Open the View-Master and you'll find the innards are actually pretty smart. There's a sliding grip inside to accommodate a range of different smartphones, as well as an additional tray to accommodate older iPhone models. As you close the front, the phone is much more secure than it is in a cardboard viewer - there's no chance it will slide out when the device is tilted, for example. However, using an enclosed case means you will have to open up the viewer to change apps or content over. Despite there being a number of apps available, there's no real way to move one to the other without accessing the phone's display and starting something new. You'll need to supply your own phone to use with the View-Master and the apps are available on both Android and iOS devices. Because you have to insert the phone and close the front, there is some limitation to the sizes of devices that will work, but fortunately, it will accommodate most regular-sized modern smartphones. The official list of compatible devices includes: Samsung Galaxy S6, S5, S4, Note 4, Moto X (2014), Moto Droid Turbo, LG G4, LG G3, HTC One, Nexus 6, Nexus 5, iPhone 6 Plus, iPhone 6, iPhone 5S, iPhone 5C, iPhone 5. There are plenty of options. Naturally the list has aged slightly and the iPhone 6S is perfectly compatible. It's worth noting that Mattel says that the iPhone 5C and iPhone 5 may not work perfectly with the VR apps. The iPhone 5 models will also need the adapter tray because the phones are a little on the small side. The Nexus 6 is pretty much the best experience you'll get: it not only supports a full range of Android VR apps, but it fills the space inside the View-Master nicely and has a large high-resolution display. The higher the pixel density (ppi) of the phone, the finer the content will look when magnified by the built-in lenses, so opting for something like the SGS6 or S7 will be better looking than the HTC One. It's worth noting that VR places high demand on the graphics (GPU) of your handset. It will therefore get hot and battery life will drain pretty fast during intensive usage. Don't expect hours of use and for your phone to continue on to last for the rest of the day. The View-Master supports Google Cardboard, so it mirrors the control mechanisms you'll find for Google's VR system. Mostly this will be through movement of your head to change the viewpoint in the virtual world, as well as use of that side trigger. The side trigger will be used for selecting items or options and is the basic control mechanism. There are no handheld controllers, so it's down to this single button and good app design to make things easy to use. As we've mentioned, the Mattel View-Master is a Google Cardboard compatible viewer, meaning it will work with all the content that's already available on Google Play or the Apple AppStore. These apps you simply download to your smartphone, open up and then place the phone in the View-Master when instructed. The good thing about supporting this system is that there's an ever changing and expanding selection of content and a lot of it is free. We've reviewed Google Cardboard separately where we talk a lot about the ins and outs of the experience. If you want to know more about that experience specifically, we'd recommend you give that a read - particularly the sections on content. Supporting Google Cardboard is a good thing because there's some key content there that you won't want to miss out on, such as the YouTube 360 video channel. It's here that you're likely to see an explosion in home-grown VR experiences with the recent launch of a number of 360 video cameras. You'll have to download the Google Cardboard app to get started and set your handset up optimally for the View-Master. There's a QR code on the viewer to scan to make this process simple. In addition to VR content that's common to all devices in the Google Cardboard ecosystem, Mattel has content of its own. This is much more education focused, perfect for giving children some way to experience a range of different environments and perhaps learn something along the way. These Experience Packs, priced £7.99 each, very much reproduce the content of the original View-Master. But this is no longer just static images, it's full-on VR content. Each comes with a number of reels in a pack, each opening up a different set of content within the theme. There are central apps for each of these Experience Packs to download to your phone and in reality, you don't need to physically buy the Experience Pack itself. You could unlock it through the app store and still get to content. But for children (for whom this content is really aimed at), having something tangible makes a difference; for parents, paying for something physical rather than just an app is easier to swallow. The reels can be scanned using the AR side of the headset, with some content viewed either in VR - a spacecraft in space - or in AR - a spacecraft in the room you're in. Having used both, we get the feeling the VR experience will be the more popular as it's much more immersive. Navigation through the experiences takes some reading and clicking and is fairly easy, but the recommended 7+ age seems right to us; although a 5-year-old will love the content, getting used to the navigation poses much more of a challenge. There are currently three Experience Packs: space, wildlife and destinations. Each of these is distinctly different, giving you the opportunity to explore the different environments. There are interactive games to play, such as to photograph the animals, as well as free-roaming options, like pointing to a star and travelling through space to discover more about it. The Experience Packs could make better use of the VR medium, as they're pretty static, but that's in-keeping with the View-Master experience of old. There is video content, but it's often framed as if you're watching it on a virtual TV, rather than letting you roam freely among the animals. For example when you're viewing piranhas, you're watching video, rather than getting a 360 video in the middle of the maelstrom. Another example might be exploring the Statue of Liberty: you can view a 360 photo from one position, but examining the Statue itself is a 3D rendering where you could be looking at the real thing, as in Google Street View. Ultimately, there's the opportunity to further enhance the VR experiences. The packaging of the Experience Packs is fun, as is the system to unlock it, as each pack comes with a pass card. This needs to be tapped on the display in the app to unlock the content. It brings a sense of occasion and adds a little more to the event. With the original View-Master system, these reels were everything, providing more and more content along different themes. It's not exactly clear how far Mattel will continue to expand this system. While other VR content is available through the Google Cardboard ecosystem, if you're putting this in the hands of children, then the Experience Packs provide a much safer environment where you know it's going to be age appropriate content - fun yet educational. The biggest barrier to this reinvention of the View-Master is that you're dependent on a smartphone. We all have these phones in our pockets and if you're an ad hoc adult user, then it shouldn't be too much of an issue. But if this is going to be keeping your children quiet on a Sunday evening, then you'll be sacrificing your phone to do it. Yes, View-Master is affordable, but that's because you've already paid for the technology: if you have an old (but fairly recent smartphone) then you might want to make a VR phone just for the occasion. You also can't avoid the fact that you have to open the viewer up to access apps when you want to switch from one to the other. You might have all the Experience Packs available to you, but there's no way to switch from one to the other within a VR environment, which is a bit of a shame. We have the same criticism of Google Cardboard in this sense: unlike the Samsung Gear VR, there's no central lobby to go to, although this is only a software barrier and with more investment in VR predicted over the next year, this may well change. Finally, the View-Finder is a handheld system - you'll have to hold it to your ace. That's ok, but for those who want to watch something longer or have free hands, that's not something that this Mattel offering provides. The new Mattel View-Master rides in on a wave of nostalgia that will leave adults reminiscing and children marvelling once again. We've put the View-Master in the hands of children of various ages and they absolutely love the experience. For only £23 for the viewer and £7.99 for each Experience Pack it's affordable enough to to get started, provided you have a smartphone to use. That cost isn't too far removed from the price that some Google Cardboard systems will ask - and with the Mattel here you're getting something a little more substantial. Sitting in the Cardboard ecosystem is a definite advantage as there's a lot of content outside of that which Mattel offers. That might not all be suitable for children, but there's plenty for adults too. Mattel's content could be a little better though. There are moments when we found we couldn't quite focus on the content, perhaps because something isn't rendered right, although this is mostly present in some of the loading screens; in contrast, most of the content is lovely and sharp. But it's very much content for children and that should be considered when looking at it. Overall, Mattel's reinvention of the View-Master is a welcome addition to the virtual reality landscape. It shows that there's a viable avenue to affordably deliver the VR experience for a younger audience. At the same time, sitting on Google's VR platform, it's perfectly capable of leveraging a wider app ecosystem too, making this fun for the whole family.